There was no Haversack or Pack listed as part of Bandolier Equipment, Pattern 1903. The Mk. 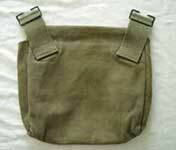 I General Services Haversack was introduced by List of Changes entry §12389, along with B.E. Patt. '03, but was not a part of the pattern. Although the main part of this entry is dated 20th October 1903, the section dealing with this Haversack has an earlier date of 19th August 1903. 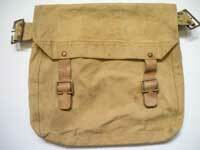 The Haversack is made of drab colored canvas and has an integral 2-inch wide shoulder strap. The side pocket, visible in the rear view, is for the emergency ration. Like almost all examples of this Haversack, this one is unmarked and undated. The picture at right shows the 6th Essex on parade, with their Mk. I G.S. Haversacks in clear view. From the Karkee Web Collection. This is an original example of the Emergency ration. 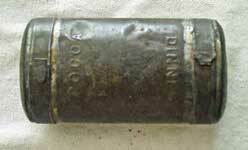 It is a sealed tin which could be opened at each end. One end, labeled "COCOA", contained chocolate, while the other, labeled "DINNER", contained a Bovril type meat paste. From the Karkee Web Collection. The Haversack, Commonwealth Pattern, is an Australian variation of the Mk. I G.S. Haversack. It is a rectangular bag of light cotton duck canvas, dimensions approximately 28-cms x 20-cms x 8-cms. 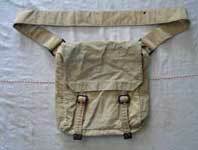 The attached strap is light herringbone web, 5-cms wide, and there is a pocket for the Emergency ration on the side. All of the metal fittings are brass. From the Grant Napier Collection, photos © Grant Napier 2009. The "Other Services" Haversack entered into service under List of Changes entry §15459, dated 20th February 1911. The entry states that this Haversack is "for units not wearing 1908 web equipment", and that it is intended to replace the Drab, N.P.D.S.. M.S. and G.S. haversacks. The O.S. haversack uses a Patt. '08 Brace as a sling. It is similarly made to Patt. '08 Web Equipment, but it is smaller than a Patt. '08 haversack. In size and shape it very closely matches the G.S. 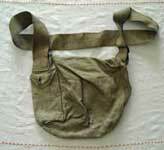 haversack, and was used with Bandolier Equipment, Pattern 1903, during the Great War. 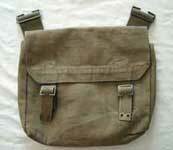 This type of Haversack often mistakenly referred to by collectors as the Pattern 1908 "mounted" haversack. This is incorrect in that this Haversack is not part of the Pattern 1908 Web Equipment, but its List of Changes entry does indicate that it was intended for mounted service, stating in part "all tabs, buckles, &c., not required for mounted troops have been removed." This example is maker marked "M.E. Co." and dated 1915. From the Karkee Web Collection. This is an Australian version of the Other Services haversack, made in yellow canvas and complete with a matching canvas strap. This Haversack is not maker marked nor dated. From the Karkee Web Collection. 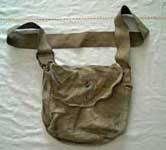 This interesting Pack is Australian, made by the Commonwealth Government Harness Factory (C.G.H.F.) in 1912. 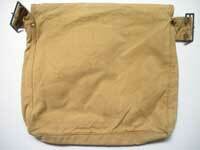 It is a rectangular bag of heavy canvas of the same dimensions as the Patt. '08 Pack. It is selvedged in leather and is fitted with two 2-inch rucksack type leather straps that mate with two leather chapes equipped with tongued Twigg buckles. There is also a leather loop mounted low on the inside rear, sized to fit the 1 3/4-inch Pattern 1903 Waist belt. We find it very interesting that a Pack with such an early date has tongued Twigg buckles on the rear (the 1-inch Twigg buckles on the front straps are not tongued). It is possible, of course, that this was a later alteration, but close examination does not reveal any signs of rework. We don't know of any documentation on this type of Pack, although speculation among collectors is that this Pack was intended as a more versatile and waterproof replacement for the Patt. '03 Greatcoat carrier. Once again, more research is required. From the Karkee Web Collection. Another interesting Australian variation of the Haversack. According to Grant Napier, this type of Haversack was used by Australian Mounted Infantry units such as the famed Light Horse, to supplement their B.E., Patt. '03. In general, it more closely resembles the Patt. '08 Haversack than the G.S. Mk. I or Other Services Haversacks more commonly used with Patt. '03, but it clearly intended for mounted use - it has no chapes or rear buckles. 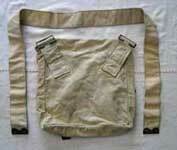 It was carried by using the 2-inch wide Brace from the Infantry Equipment, Australian Pattern (Leather) as a sling. This example has a canvas body and tongued Twigg buckles. Examples are also known with web bodies. It is maker marked "C.G.H.F." and dated 1917. From the Leigh McCann collection, photos © Leigh McCann 2009.